When it comes to diagnosing and preventing cancer, being late to the party isn’t really an option. The smart money is on early detection and, in turn, early treatment. Very early. Because waiting for symptoms to appear can often mean waiting until it is too late. While treatment options for various cancers have steadily become more advanced and available, a cancer which is not detected until it is late-stage will likely be too advanced to be cured, regardless of the sophistication of available treatment. Two forms of cancer which have proven most deadly if diagnosed at late-stage are lung cancer and ovarian cancer. Lung cancer is the leading cause of cancer deaths worldwide. With 80% of cases escaping diagnosis until they are late-stage, lung cancer has a poor overall five year survival rate of just 18%. Ovarian cancer is responsible for the greatest number of gynaecological cancer deaths worldwide. As is the case with lung cancer, the majority of patients (61%) are not diagnosed until late-stage, and this cancer has a correspondingly low five year survival rate of 46%. Early detection, on the other hand, sees five year survival more than double for lung cancer, while ovarian cancer five year survival increases to better than 90% when detected early. Currently the most commonly used diagnostic tests for both lung cancer and ovarian cancer are invasive and expensive combinations of imaging and biopsy, and some of the available tests may not produce consistently accurate results. For these and other reasons, screening for cancer is not always recommended, and diagnosis frequently occurs after symptoms have appeared in later stages of the cancer’s progression. 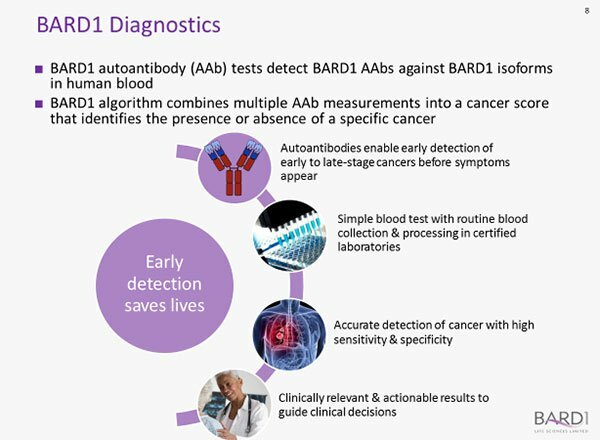 Innovative ASX junior BARD1 Life Sciences Limited (ASX:BD1) has both these cancers in its sights, with a pipeline of novel diagnostics and therapeutics based on BARD1 biomarker platform. The BARD1 protein acts as a tumour suppressor in healthy people, but abnormal BARD1 proteins found in people with cancer can make cancer worse and are an important tumour biomarker in cancer. It is still a speculative stock, however, so investors should seek professional financial advice if considering this stock for their portfolio. BARD1 testing, via simple blood tests, is non-invasive and cost effective. Best of all, early studies show the BARD1 testing to be promising in detecting lung and ovarian cancers (and potentially other cancers also) while still at early stage. The promise of its testing could be further validated following an assay development agreement it has entered into with Thermo Fisher Scientific for custom research assay development of a multiplex autoantibody test system using ProcartaPlex® Technology for BARD1’s research and evaluation. The company sees this agreement as an important milestone that will enable it to initiate clinical testing to evaluate the accuracy of the new multiplex BARD1-Ovarian test for early detection of ovarian cancer in early 2019. If successful, the companies could extend the partnership to supply research autoantibody kits to BARD1 for its use in further research studies. Pilot studies for BARD1-Lung already show great promise for early detection of lung cancer. Recent studies for BARD1 Ovarian have produced particularly pleasing results, confirming high accuracy for the detection of this cancer, with impressive scores for sensitivity (yielding a positive result when disease is present) and specificity (yielding a negative result when disease is absent). The third string in the BD1 bow is the research stage BARD1 Vaccine that is currently being evaluated in research collaboration with the Institute for Respiratory Health (IRH). Stage 1 of the research has now been completed, with Stage 2 to evaluate effectiveness in animal models currently underway. On the Intellectual Property (IP) front, this year has already seen two further patents granted to BD1, including a Japanese divisional and Israeli Patent. This patent family relates to the use of BARD1 isoforms in the detection, treatment and prevention of lung and colorectal cancer, and grants protection until 2031. These latest patent approvals bolster the company’s IP portfolio, after US, Chinese and Australian patents covering lung cancer diagnostics were granted last year. Upcoming for this small cap biotech are key development milestones for the diagnostic and therapeutic projects, as well as a strategic commitment to expand commercial opportunities for the technology. 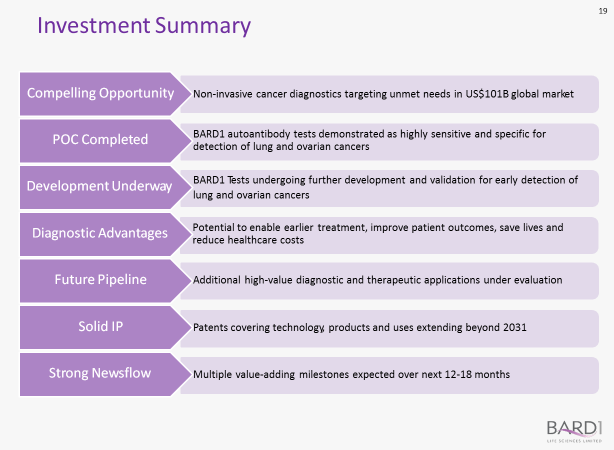 At the same time as advancing the development and analytical validation of the BARD1 tests toward clinical validation studies, the company will also be exploring strategic business opportunities to expand its product pipeline, diversify its risk profile, and grow long-term shareholder value. 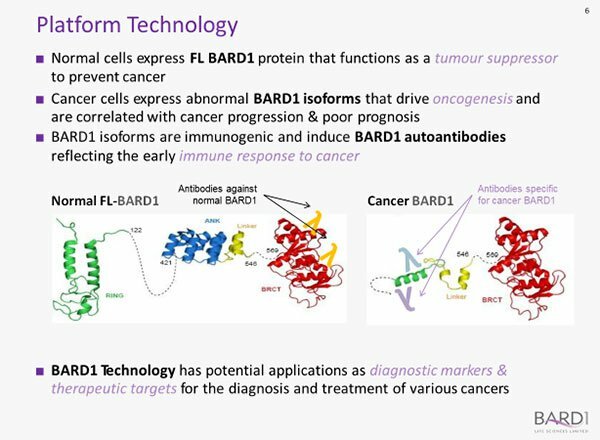 BARD1 Life Sciences Limited (ASX:BD1) is an Australian biotech developing novel diagnostics and therapeutics for unmet needs in the early detection and prevention of cancer. Since we last caught up with BD1 in last year’s article Beating Cancer via Early Detection: ASX Stock Targeting Multiple Billion Dollar Markets the company has not only raised $1.3 million before costs but has been forging ahead with its portfolio of diagnostic and therapeutic products. Armed with its proprietary BARD1 Technology, the company is committed to transforming the lives of cancer patients with safe and effective diagnostics and therapeutics for cancer. This is no more evident than in it recent news where BARD1 announced it had signed an Assay Development Agreement with Thermo Fisher Scientific for Multiplex Research-Use-Only (RUO) Custom Assay Development. This means a RUO BARD1 autoantibody assay will be developed using ProcartaPlex® Technology for performance on Luminex® instrumentation. The project commenced on last week and is expected to take approximately nine months, with deliverables including Assay Feasibility Report, Development Report, Protocol, Standard Operating Procedures, Assay Validation Report, BARD1-autoantibody kits for research and evaluation, and transfer documentation. The first application of the ProcartaPlex® Technology is to the BARD1-Ovarian test that BARD1 plans to develop for detection of ovarian cancer. This fits nicely with the results of the recent BARD1 ovarian studies. The big recent news for BD1 is the impressive set of results achieved in studies involving its BARD1 Ovarian product. BD1 had previously posted pleasing results for its OC-POC1 and OC-POC2 proof-of-concept studies of a 10-panel assay, and the larger OC-300 study of a 40-panel assay in 348-samples. Following on from these encouraging results, the company conducted its retrospective, case-control OC-400 study of a refined 20-panel assay using 400 bio-banked ovarian cancer samples and age-matched healthy controls. The objective of this study was to optimise the BARD1 panel and algorithm used for the early detection of ovarian cancer. Most recently, the life sciences company again impressed with its announcement of yet another positive set of results from follow-on study OC-400V. The objective of this study was to evaluate the robustness of the algorithm generated in the OC-400 study, by applying the test to an independent test set of 82 new ovarian cancers and 27 previously tested healthy controls. With justifiable enthusiasm BD1 announced that the results of this independent follow-on compared favourably with the results of the original OC-400 study. With an AUC index value of 0.89, 89% sensitivity and 82% specificity, the results confirm the robustness of the algorithm, and its potential as a diagnostic aid for early detection of ovarian cancer. Not only has BARD1 Ovarian performed with high accuracy in these studies, it did so with a reduced panel of 20 peptides, potentially reducing the complexity and cost of the test, and paving the way for transfer of the research assay to a commercial platform. This is a significant milestone for the ASX junior, with ovarian cancer the leading cause of gynaecological cancer deaths worldwide. 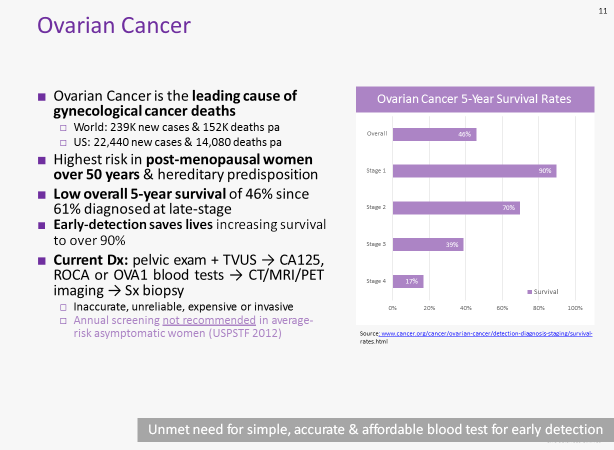 In developing a non-invasive, accurate and affordable blood test for early detection of ovarian cancer, BD1 has taken aim at a globally important unmet need. This latest success did not go unnoticed. Hot on the heels of the announcement of the OC-400V results on 6 March 2018, BD1’s share price took a giant 130% leap. This, combined with a jump in the share price on the January test results announcement, sent the share price up as much as 450% from its December low. As discussed above, with such promising results on hand, BD1 is outsourcing the next stage of assay development, including building a commercial test and completing technical validation, before undertaking clinical validation studies to support marketing and licensing of the test. This will enable BARD1 tests to be performed by most hospital and independent clinical laboratories around the world. 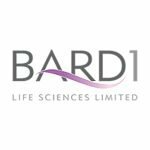 BARD1 intends to finalise contract negotiations with its preferred partner and commence the custom assay development project to develop and analytically validate the BARD1-Ovarian test on the commercial platform in Q4 FY18. 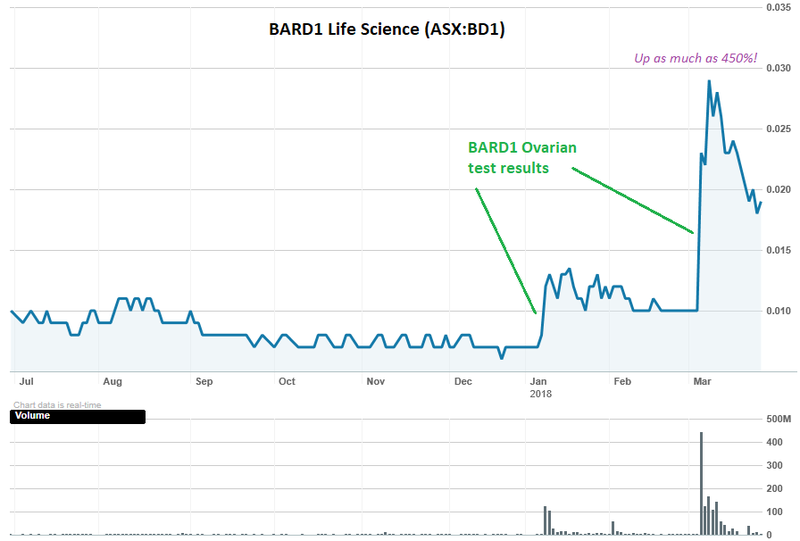 BARD1 has also undertaken clinical validation studies to demonstrate the clinical performance of BARD1-Ovarian for early detection of ovarian cancer to support future marketing and/or licensing of the test. The science: how does the algorithm work? An Enzyme-Linked Immunosorbent Assay (ELISA) is used to detect the autoantibodies in a blood sample, and the BARD1 Technology algorithm is then applied to combine multiple autoantibody measurements into a cancer score. It is this score which identifies whether or not a specific cancer is present. In parallel with the BARD1 Ovarian programme, BD1 has taken aim at a huge unmet need with its BARD1 Lung product. 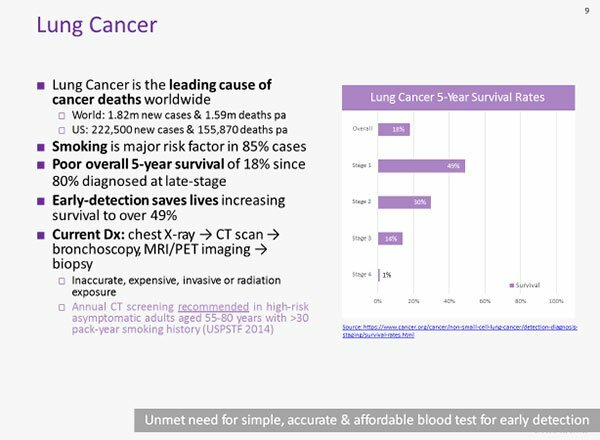 With lung cancer causing more cancer deaths worldwide than any other cancer, and with late-stage diagnosis a significant contributing factor to the mortality rate, there is an excellent opportunity for a product such as BARD Lung to provide accurate, reliable and affordable early detection for lung cancer. Pilot studies of BARD1 Lung yielded preliminary results suggesting high accuracy for detection of lung cancer, with up to 80% sensitivity and 77% specificity. Additionally, there have also been promising results for gender-specific algorithms in the LC-600 Study. Last year BD1 had postponed the BARD1 Lung programme to allow greater focus on the successful completion of the OC-400 (ovarian cancer) study and further development of the assay (test) on a the commercial platform. However resumption of the lung cancer programme is now expected in the second half of 2018. The schedule will include additional retrospective studies aimed at optimising and analytically validating BARD1 Lung, prior to advancing to clinical validation studies. 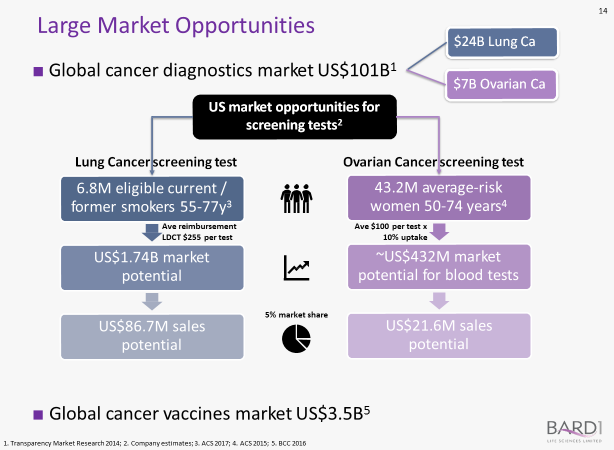 Like cancer diagnostics, the US$78.2 billion cancer therapeutics market is poised for significant growth (predicted to reach US$111.9 billion by 2020), and BD1 is intent upon grabbing a slice of that growth with its BARD1 Vaccine product. Of course how much of the market BD1 is able to attract remains to be seen, so investors should seek all publicly available information and professional advice before making an investment decision. Research is now in full swing, in collaboration with the IRH. Stage 1 of the research programme to identify high BARD1-expressing tumour lines, was completed in August 2017. Stage 2, currently underway, aims to evaluate the in vivo effectiveness of the BARD1 Vaccine formulations in reducing tumour growth in animal studies (studies conducted under Animal Ethics Committee approval). For a junior at the table, BD1 is holding an impressive hand including a portfolio of patent protected promising products: divisional Japanese patent number P6271636 which provides additional protection over the parent case P5938406 for modulators such as siRNA molecules of specific BARD1 isoforms for use in treatment or prevention of lung or colorectal cancer and Israeli patent 22476 which protects the sequence of various BARD1 isoforms specific to lung and colorectal cancer, a method for detecting the presence of the specific BARD1 isoforms, and a method for treating and/or preventing lung cancer and colorectal cancer. Its hand also includes a products for globally significant unmet needs in a world market that is enormous and growing. Bringing to this lucrative table a portfolio of related, but risk-diversified, novel products that each play to an area of unmet need in the combined market, this life sciences company appears to be enviably well placed. With a current market cap of just $9.7 million, among peers of up to nine or ten times this, BD1’s potential for growth and upside seems self-evident. Of course the level of attraction BD1 can generate and convert to revenue is yet to be proven, hence if you are considering this stock for your portfolio you should take all public information into account and seek professional financial advice. In August 2017 BD1 completed a successful capital raising of $1.5 million through a placement to sophisticated investors followed by a Share Purchase Plan (SPP). Much of the capital raised was applied to advancing research and development, and supporting BD1’s commercial initiatives. More recently, in March 2018 BD1 raised another $1.3M to strengthen its cash position, as it prepared for its upcoming milestones. BARD1 is also continuing to explore strategic business opportunities including business combination, acquisition, in-licensing, and other transactions to strengthen its business, expand its product pipeline, diversify its risk profile, and grow long-term shareholder value. If its fortunes remain, expect to see BD1 continue to ride the wave of positive results as these milestones are ticked off. They make a good point – seven of them in fact. With each successive study attesting to the accuracy of the BARD1 tests, it seems BD1 is well on the way to cracking the early detection puzzle when cancer can be cured for a number of cancers. If this does eventuate, BD1’s accurate, non-invasive, cost effective tests could be ready candidates for government or public health screening programs. This would be a big deal: pay day for BD1, and for its shareholders. Yet, this is early stage and investors should seek professional financial advice if considering this stock for their portfolio. However, even more significant than the potential for share value upside, is the potential for a very real improvement in the degree to which some of our most devastating cancers worldwide can be detected, treated and lives saved. If BD1’s stable of products delivers as studies currently suggest it should, then it will be blue sky ahead not only for this life sciences company and its shareholders, but also for the millions of people worldwide who will develop cancer over the next ten years and may get to benefit from early cancer detection by a BARD1 test. This will be one to watch, on every level.